So if you’ve opened this article you’re likely trying to create a library for Cocoapods that uses other Cocoapods. It seems simple in principle, but there’s virtually no official way to do it. Only through scattered StackOverflow posts and Github issues was I actually able to figure it out. So first things first, you obviously need to install cocoapods. Open up your terminal (you’ll be using that a lot) and enter in the command below. If the above command is taking forever, run it with the --verbose flag. That way you can see what it’s getting hung up on. Anyways, now that we have Cocoapods installed, it’s time to create the pod itself. We’ll use a command called pod lib create to setup the file structure of the library. Running this command also lets you configure many options. The command output below will tell you what to choose. Cloning `https://github.com/CocoaPods/pod-template.git` into `MyPodName `. I don’t cover testing / view based testing in this tutorial, but that shouldn’t stop you from looking into it on your own. If there’s enough interest, I’ll put up a tutorial covering that as well! First, you’ll need to edit the MyPod.podspec file. This file contains the information needed to create your pod, so it’s pretty important. You can go back and properly fill this file out later once you prepare to release it, but for now, make sure you make these key changes. Write a proper summary and description. Cocoapods will not give your pod the OK unless this is done. After this, build the project. Now, we’ll add some code to the Example Project to make sure our pod is working. 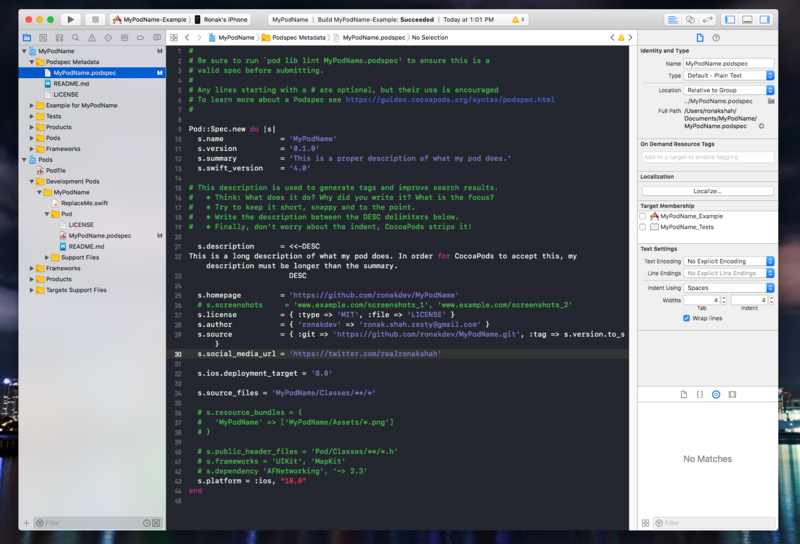 In MyPodName/Example for MyPodName/ViewController.swift, create an object that uses MyPodName.
} Note: Sometimes the above code will fail, saying that you can't construct `MyPodName`. I've found that simply deleting and retyping the code will make it work. If you continue to have issues, leave a comment below! Now, build and run the project in the simulator. You shouldn’t see anything on the screen, only a console message that says whatever you put in the temp function. Now, the project has been setup and factored properly, and it’s time to add our pods. To add our dependent pods, we’ll need to add them to two files. It is imperative that you write the exact same version in both places. If you don’t, you’ll probably break your project. I’ll be using Alamofire and SwiftyJSON in this example, but feel free to use any Cocoapod you want. Now, we’re almost done! 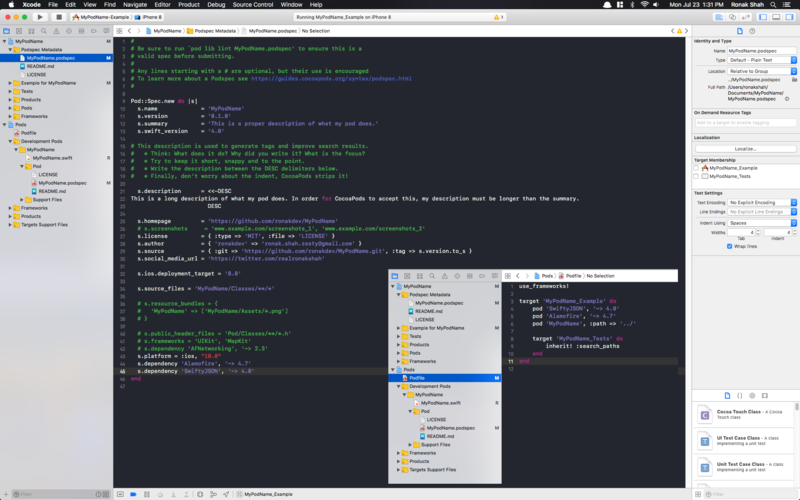 Reopen your project (open Example/MyPodName.xcworkspace) and build! We should now be able to import our dependencies in MyPodName.swift. Congratulations! You can now write a library that depends on other libraries! This tutorial was heavily inspired from this tutorial to create a regular Cocoapod and these StackOverflow Posts. (Yep, they are all seperate links). I learned how to create these types of pods as part of my work at Zesty.io.